It is one of those records that may never be broken, although 14 years later Billy Rohr of the Boston Red Sox came very close. In his first major-league appearance, a start against the New York Yankees on April 14, 1967, the 21-year-old Rohr came within a single strike of pitching a no-hitter when Elston Howard singled in the bottom of the ninth. But like Bobo Holloman, Rohr won only two other games in his career. As a boy, Junior helped his father, a truck farmer. In fact, amid the Great Depression, he was forced to quit high school after just one year. Father and son hauled sweet potatoes and watermelons to Florida and brought oranges back to Georgia. In 1940, the Hollomans moved about 100 miles northeast to Athens, Georgia. There Junior met Nan Stevens, daughter of Jessie and Maxine Stevens. Nan recalls the Sunday night “that good-looking, coal-black haired, brown-eyed ‘new’ boy in town” gave her a ride home from the Mars Hill Baptist Church.5 They were married on January 24, 1942. Holloman served in the United States Navy, and early in their marriage he was stationed at Port Hueneme near Oxnard, California. He then shipped overseas for 11 months until his discharge in December 1945. Holloman played sandlot baseball as a youth; while at Port Hueneme, he pitched for the base’s team. Back at home in 1946, he tried out for the Macon Peaches, a Class-A baseball team affiliated with the Chicago Cubs in the “Sally” (i.e., South Atlantic) League. The team liked what they saw in the 6-feet-2, 200-pound hard-throwing right-hander, and assigned him to the Moultrie Packers, a Class-D team in the Georgia-Florida League. There he enjoyed an all-star season, striking out 184 batters in 216 innings and compiling a 20-5 record with a 2.33 ERA for his favorite manager, Jim Poole. At one point, he pitched a doubleheader to make up a turn, so he could come home for the birth of his son, Gary Lee, on July 4, 1946. Six weeks later, young Gary, nicknamed “Little Papoose” since his papa was “Big Indian Chief” to the Moultrie fans, witnessed his first baseball game. The Big Chief pitched and won and hit a home run. That winter, Holloman pitched in Cuba with the Oriente team in La Liga de la Federación (an “alternate” league that existed for one season in the wake of the Mexican League’s player raids). It was not an especially successful season, as he lost a league-leading six games in a brief 40-game schedule.6 Back in the United States in the summer of 1947, Holloman won 18 games and lost 17 for Macon. He began the 1948 season with Macon but was promoted to the Nashville Vols, the Cubs’ Double-A affiliate in the Southern Association. He played there on and off through 1951. His combined record in 1948 was 15-5; in 1949, spent entirely with Nashville, he was 17-10. It was in “Music City” that Alva Lee became “Bobo.” At the time, 6-feet-2, 220-pound right-hander Bobo Newsom was an American League All-Star pitcher. Larry Gilbert, the Vols’ owner, gave Holloman the same nickname saying, “You’re big, you have a strong arm, you like to pitch and you like to talk. You remind me of Bobo Newsom.”7 Holloman was a boastful, overenthusiastic, harmonica-playing, hot-headed man. Bobo was also superstitious: each time he entered a game, he would stop near the foul line on his way to the mound, bend down and draw the initials “GN” in the dirt — letters that stood for his son Gary and wife Nan. He considered using “NG” — but that, he said, did not connote a positive outcome. In 1950 Bobo pitched over 200 innings for the fourth time in the first five years of his professional career. He picked up 13 wins against 13 losses while pitching for both Nashville and Shreveport, Louisiana, a Texas League team. In 1951, after a poor start at Nashville, Holloman and the Cubs parted ways. They sold his contract to Albany of the Eastern League, which in turn sold him on to Augusta, an unaffiliated club in the South Atlantic League. With an 11-9 record, he pitched well enough to be noticed by fellow Athens, Georgia, resident Spud Chandler. The former New York Yankee pitcher, then a scout, influenced Augusta to sell Bobo’s contract to the Syracuse Chiefs (also unaffiliated) of the International League in 1952. At age 29, he was at last just a step away from the majors. Bobo Holloman loved to throw. In the days before pitch counts and relief specialists, he averaged more than 210 innings per year over the first seven seasons of his pro career (1946-1952), not counting winter ball or spring training. The best of those winter seasons came in 1952, right after his success with Syracuse. At the suggestion of his International League opponent, future Brooklyn Dodger Junior Gilliam, Bobo played for the Santurce Cangrejeros club in Puerto Rico. Holloman was both the Crabbers’ ace and workhorse, leading the league with 15 wins.9 In the Puerto Rican league finals against San Juan, he pitched a 13-inning 7-5 victory on two days’ rest, enabling Santurce to reach the Caribbean World Series in Cuba. Despite his heavy workload, he got two of the team’s six wins in the round robin, both over the Caracas Leones.10 The Crabbers were undefeated. Coupling his regular-season and postseason output for Santurce with his Syracuse victories, he probably had more wins that year than any other professional pitcher. On the strength of that outstanding performance, Big Bobo was finally headed to the big leagues. In October 1952 he had been traded by Syracuse to the St. Louis Browns for pitcher Duke Markell and $35,000 ($10,000 up front and $25,000 if Holloman remained on the Brownies roster past June 15). The Browns had resided in or near the basement of the American League since 1946, and Bobo was hoping to make a difference. 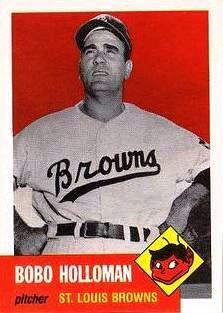 Bobo Holloman made his major-league debut on April 18, 1953, in relief. He thought he was best as a starter, but manager Marty Marion used Holloman only out of the bullpen. And even at that, Bobo was not very effective in April. In four brief outings, he pitched 5 1/3 innings, allowing five runs on 10 hits and three walks. His ERA was nearly 9.00. The Browns won, 6-0. Holloman struck out three, but six batters reached base — one on an error (Holloman’s own) and five on walks. Three of those walks were in the ninth inning. And to top off this amazing night, Bobo’s improbable pitching performance was matched only by his improbable batting performance. He collected three RBIs that night with two singles — his only hits and RBIs in his major-league career. Bobo Holloman never pitched another complete game. He came close on June 21 when he defeated the Red Sox on two hits, 2-0 — his third and last major-league victory — but he needed relief help from Satchel Paige in the ninth inning. Plagued with a sore arm, Bobo pitched in his final major-league game on July 19, 1953. His pitching line for that season — and for his career — is 22 appearances, 10 starts, 65 1/3 innings, 3 wins, 7 losses, 25 strikeouts, 50 walks, 5.23 ERA…with one complete-game shutout. On July 23, 1953, the Toronto Maple Leafs, a Triple-A team in the International League, purchased Holloman’s contract from Bill Veeck. Holloman appeared in 13 games, starting eight of them, but he clearly was not regaining his form. He allowed 53 hits and 31 earned runs and walked 43 batters in 55 innings. Bobo returned to Puerto Rico for the Winter League, but left early with an 0-2 record and a sore arm.13 The following summer he bounced around playing for five different teams in five different minor leagues. But by the end of 1954 Holloman was out of baseball entirely at age 31. He returned to Georgia and made a living driving trucks for a while, as he had done during his playing days. He then worked as a foreman at Roper Hydraulics, a tool and die company in Commerce, Georgia. The local hero stayed involved in athletics in a small way by coaching Little League baseball and officiating high school football, but he kept his competitive juices flowing in a big way by taking up golf. He soon became a par golfer, and along the way, he imparted the love of the game to his son, Gary. At about age 14, the Little Papoose caddied for the Big Chief until Gary himself became quite good in his own right. Following his collegiate golfing career at the University of Georgia, Gary got his Professional Golf Association card in 1974. Over the years, father and son entered and won several tournaments in Georgia. He turned his energy to starting his own advertising company which he called BoNanGa, named, of course, after Bobo, Nan, and Gary. In 1974, he also worked as a part-time scout for the Baltimore Orioles in the Georgia area. He was invited back to participate in several Old-Timers games in major league parks. On May 1, 1987, Alva Lee “Bobo” Holloman Jr. died of a sudden heart attack at his home in Athens, Georgia. He was 64. In February 2006, Bobo was inducted into the Thomaston-Upson Sports Hall of Fame. His adoring widow, Nan, accepted the plaque. I cannot write this biography without acknowledging the truly spiritual joy I experienced by meeting Bobo’s widow Nan Holloman. Nan spoke with me by phone from her home in Athens, Georgia, on May 23, 2005. To help my research, she sent me one of her last remaining autographed copies of This One and That One: The True Life Story of BoBo “No-hit” Holloman, the book she wrote in 1975 (printed by Southeastern Color Lithographers, Athens, Georgia). Thank you, Nan. Various Authors. The Ol’ Ball Game: A Collection of Baseball Characters and Moments Worth Remembering (New York: Barnes and Noble, 1990). Graham, Frank. Great No-Hit Games of the Major Leagues (New York: Random House, 1968). 1 The second-fewest wins by a major-league pitcher who threw a no-hitter: 7, by George Davis. 2 This article was written at the beginning of the 2009 season. This list of 21 rookies includes pitchers who pitched their no-hitters in a year after their debut year — in the case of Sam “Toothpick” Jones, four years after his MLB debut! — in accordance with MLB rules. 3 Charlie Robertson threw his on April 30, 1922, which was his third start; and two others threw their no-hitters in their fourth major-league start — Bo Belinsky on May 5, 1962, and Burt Hooton on April 16, 1972 (the first start of his first full major league season). 4 Published accounts of Holloman’s date of birth vary from 1923 through 1926. For the March 7, 1923, date of birth used in this biography, the author relies on: (1) This One and That One (1975, Self-published: Third Print 2006) by Nan Holloman, at page 3; (2) the presentation at Holloman’s induction into the Thomaston-Upson Sports Hall of Fame (see http://www.tusportshalloffame.com/ALVA%20LEE%20HOLLOMAN.htm); and (3) the online player profiles published at www.baseball-almanac.com, www.baseball-reference.com, and www.retrosheet.org. 5 Nan Holloman. This One and That One (1975, Third Print 2006), 5. 6 Jorge S. Figueredo. Béisbol Cubano: a un Paso de Las Grandes Ligas, 1878-1961 (Jefferson, North Carolina: McFarland & Company, 1995), 251-252. 9 Jose A. Crescioni Benítez. El Béisbol Profesional Boricua (San Juan, Puerto Rico: Aurora Comunicación Integral, Inc., 1997), 86. 10 Thomas Van Hyning. The Santurce Crabbers (Jefferson, North Carolina: McFarland & Company, 1999), 41-42. 11 Bill Veeck, with Ed Linn. Veeck — As In Wreck (Chicago: University of Chicago Press ed., 2001), 297. 12 Ibid., loc. cit. Veeck’s memory was a bit faulty, as it was elsewhere in his memoir. It was Vic Wertz who recorded the last out, but he was the right fielder for the Browns that night, not the first baseman. 13 Thomas Van Hyning. Puerto Rico's Winter League (Jefferson, North Carolina: McFarland & Company, 1995), 55.